About a month ago, Adrian Dater of the Denver Post suggested that the Colorado Avalanche would be wise to pursue free agent Shane Doan. While that argument could certainly be made for literally almost any team in the NHL, it made sense specifically for the Avs for two reasons: a) with over $16 million left in cap space and with some money yet to spend just to get to the floor (according to CapGeek.com), Colorado can afford to toss a sizable and attractive deal Doan’s way, and b) as the youngest team in the league, the Avalanche could certainly benefit from the leadership provided by a player of Doan’s ilk. Having said that, there’s still the issue of Ryan O’Reilly’s RFA status which, when rectified, would not only add to Colorado’s payroll, but also address the long term leadership situation, as many peg O’Reilly as the franchise’s next captain. For the time being, as Dater himself points out, the team already as an experienced, 36-year-old captain in the mix, negating the absolute necessity of signing a player like Doan. At any rate, the conversation itself raises questions in regards to how Milan Hejduk is perceived as the captain of the Avalanche at this point in their history and/or in his career, and whether or not he has to be considered one of the more underrated captains in the league today. Drafted in the 4th round (87th overall) by the Quebec Nordiques in the 1994 NHL Entry Draft, Hejduk remains one of only two active NHL players drafted by the franchise in the pre-Avalanche era (see below for the name of the other guy). While Hejduk was not around for the first of Colorado’s two Stanley Cups (remaining in his native Czech Republic with Pardubice HC for four years after being drafted), he did make an immediate impact with the team upon his arrival in North America, scoring 36 & 41 goals in years two & three of his NHL career after a solid 48 points in his rookie season. Those 41 goals, of course, were scored during the regular season of team’s second championship effort, a playoff run wherein Hejduk scored 23 points in 23 games, good for second on the team in playoff scoring behind Joe Sakic. After a quieter year in 2001-02 (44 points in 62 games), Hejduk bounced back with a Richard Trophy winning effort in 2002-03, scoring 50 goals, a career high. Despite those considerable contributions to the history of the franchise, Hejduk’s name does not jump to the forefront in any discussion of ‘great NHL captains’; perhaps it would even be wise not to assume that the average hockey fan is even aware of the fact that he has that title in Colorado. That he is somewhat ‘under the radar’ could stem from the fact that he was able to play with the likes of Sakic & Forsberg along the way, potentially if not probably boosting his career totals as a result. And while Hejduk does have his name on the Cup, he was not in the captain’s chair when the Avs won in 2001, nor has the team been able to achieve any great successes during his tenure. All this, and the fact that his name just doesn’t bring along with it the ‘sexiness’ of some of his fellow captains, could in some way weaken the impression of Hejduk’s standing as a respected NHL captain. What’s interesting to note, however, is how Hejduk stacks up when measured against his fellow NHL captains. In terms of career numbers, Hejduk enters the 2012-13 season with an average of 0.374 G/G, which would put him 6th among all current NHL captains (with four current vacancies & five positions being held by D-men, meaning he would likely fall to no lower than 10th overall). When it comes to current captains with a Stanley Cup ring on their resume, Hejduk is one of only ten to have played on a championship team. And when you further examine the goal scoring averages within the context of the list of captains who have won Cups, you discover that Milan Hejduk ranks 4th with an average of 0.374 GPG, behind only Sidney Crosby (0.513), Jonathan Toews (0.398) & Eric Staal (0.389). With that in mind, the argument can certainly be made that Milan Hejduk ranks among the most underrated captains in the NHL today. The reality is that many NHL teams would be hard pressed to find a captain who possesses both a proven track record in terms of consistent production and a Stanley Cup ring to boot. The latter distinction alone separates him from other captains with much bigger names and reputations, such as Jarome Iginla, Shane Doan, Shea Weber, Daniel Alfredssson, Joe Thornton, Henrik Sedin & Alexander Ovechkin. Granted, Hejduk did not sport the ‘C’ in 2001, but suffice it to say that he played a major role on that team, and it’s an experience that quite simply can’t be taken away from him. And while Hejduk benefited from having the puck dished to him from Sakic & Forsberg, there’s certainly much to be said about what he must have been able to learn from them both on and off the ice, which he in turn can now pass on to the next wave. 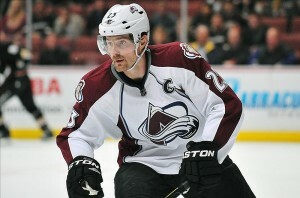 After signing a new deal at a relatively modest $2 million for the 2012-13 season, Hejduk will be back in the fold for at least one more year, with a chance not only to pass Sakic as the highest goal scorer in the Colorado edition of the franchise, but also to help propel a young team into the playoffs for the first time in three years. While the former would cement his legacy as the one of the great Avalanche players, the latter would go a long way in demonstrating that Hejduk is indeed an NHL captain worthy of greater appreciation.